It is not often that the German side of World War I and II is glamorized in Western culture but it appears that Australian slots developer Aristocrat has decided to base its theme for this Red Baron slot on the top German fighter pilot of World War I. Red Baron is a 5 reel, 243 ways to win slot with the Manfred von Richthofen, the “Red Baron” himself, taking centre stage. He was a hero in the eyes of the German people and an arch nemesis for the Allied forces until his death in combat on 21st April, 1918. He divided opinion depending on which side you were on but nobody could doubt the respect he earned from his skills as a pilot during the war having achieved over 80 air combat victories during his time with the Imperial German Army Air Service. Can You Feel the Reel Power? This slot also has the superb Aristocrat feature of Reel Power. This means that the more reel positions that are in play, the more ways you can win. This can vary from 7 reel positions in play with 3 ways to win all the way up to 15 reel positions in play with 243 ways to win. 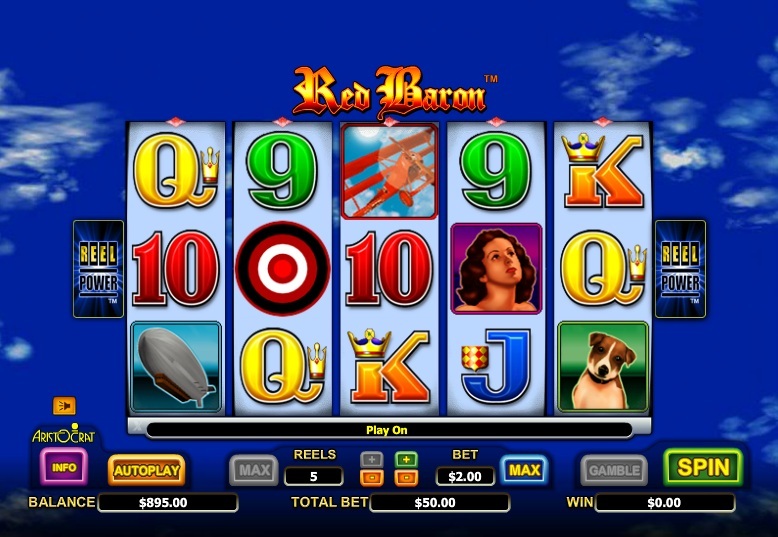 For all symbols, except for the target Scatters, winning combinations achieved pay through any position on the playable reels and the centre reel only on other reels. Symbols on the reels are all associated with the German war effort in World War I and they include the “Red Baron”, his fighter plane, his love interest, a blimp, dog, radio, and the regular 9-through-to-King symbols. The Wild symbol is represented by the combat medal. This symbol substitutes for all other symbols on the reels to complete any potential winning combinations across the reels. The Wild only appears on reel 3. During the free spins bonus round, it is possible for wins triggered by a Wild to earn up to a 5x multiplier. 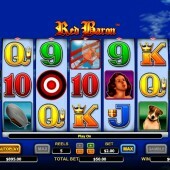 Red Baron is one of Aristocrat's more noteworthy slots. Reel Power is always a good feature to see on their slots. If you've played the historical Pompeii slot or the Chinese-themed Choy Sun Doa slot then you will know what it is all about. The best part for me about this slot is how it ties the free spins bonus round into the legend of the “Red Baron”. The fact that taking down planes wins you prizes forges that link and the more planes you down, the bigger the wins. I think this unique aspect to the slot sets it apart and if more slots have individual features linked to their themes then it would make for a much more varied market. Credit to Aristocrat for doing it.